It’s been a week since we stuffed ourselves silly at Thanksgiving, and I’m only now catching up with real life again! Thanksgiving at my brother’s Manhattan apartment has become a tradition for my family; this might have been the 5th year running! It’s only right though–for a holiday that is almost solely focused on food (and a wee bit of thanks thrown in), you gravitate to the best chef. In my family, the crown goes to my brother, and he certainly wears it with pride. Dane always prepares a surprisingly traditional menu of dishes (i.e. turkey, cranberry sauce, stuffing, mashed potatoes, etc), but the food is so elaborately, carefully, and lovingly prepared, that it pretty much beats every other meal ever. But before that happens, we eat burgers. Last year, we ate at 5 Napkin Burger, and this year, it was P.J. Clarke’s that provided our pre-Thanksgiving grease. The burgers are delicious, the gin & tonics perfectly refreshing, and a special artisanal ketchup on the table may have been slathered on every bite. PJ’s was also a fantastic example of a restaurant that trains its staff on a responsible approach to dietary restrictions. Our seasoned waiter knew everything about frying oil used, allergens in the kitchen, and completely quelled my concerns with his comments: “You have nothing to worry about–we have plenty of people come in with allergies, especially peanut allergies.” A great meal to expand our stomachs! Cornbread Stuffing…wish it just didn’t look so delicious! And now, for what you’re actually reading this for: the big Thanksgiving meal. I was the only one present with a dietary restriction, but since it was a small group of family and close friends, I was actually shocked to discover my brother’s intention of preparing a cornbread stuffing. It was my almost-daily intake of cornbread muffins at my work cafeteria that led to the development of my intolerance, so I have long had to turn my back on cornbread (and all other corny things – bad jokes not included). I grudgingly accepted Dane’s justification that he would make normal bread stuffing as well, there would be no worry of cross-contamination, and there would be a ridiculously large variety of other foods for me to eat. Yah, yah. Fine. I didn’t push–there was no need to make a scene, although I do feel that it would have been just as easy to have a perfectly allergen-free Thanksgiving. I’d love to hear your thoughts on this issue! The preparation began at 9:30am with 2 pies made by my mother and I, and the kitchen was rocking for the rest of the day! Check out the dishes below! Our 14lb bird, and our 5lb gremlin. A gorgeous presentation, as per usual. The cauliflower and brussels sprout gratin. The table is groaning at this point. Quite the full plate. Polished off in record time by yours truly. Don’t forget the pie! Pumpkin and chocolate-pecan with handwhipped (seriously) whipped cream. Hope you all had an amazing Thanksgiving! As I have only just returned from the big city, I thought it timely to showcase a fellow blogger and friend who writes a fantastic blog on nutrition, exercise, life in NYC, along with an occasional clothing montage. She’s over at Lilveggiepatch, and I encourage you all to check out her blog. Hi Persnickety readers! My name is Katie and I write a little blog called Lilveggiepatch, where I share my life, loves, and culinary fare here in New York City. I’m here today to share some of my favorite vegetarian and vegan eats around the city. Enjoy! 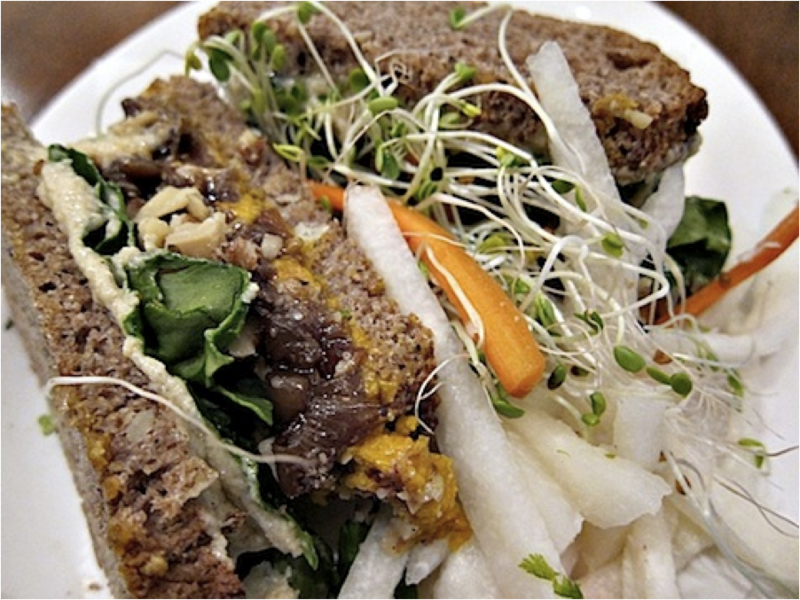 Peacefood Café (460 Amsterdam Avenue) is one of my favorite places to eat, vegetarian or not. (All of the menu items are 100% vegan.) The vibe inside is relaxed and tranquil, and all of the staff seems genuinely happy to be working. They have several killer menu items, most notably the Japanese pumpkin sandwich with caramelized onions, ground walnuts, mixed greens and cashew cheese. Order this with a side of chickpea fries and Peacefood will be on your mind for weeks. Caravan of Dreams (405 East 6th Street) is a vegan and partly raw restaurant in the East Village. 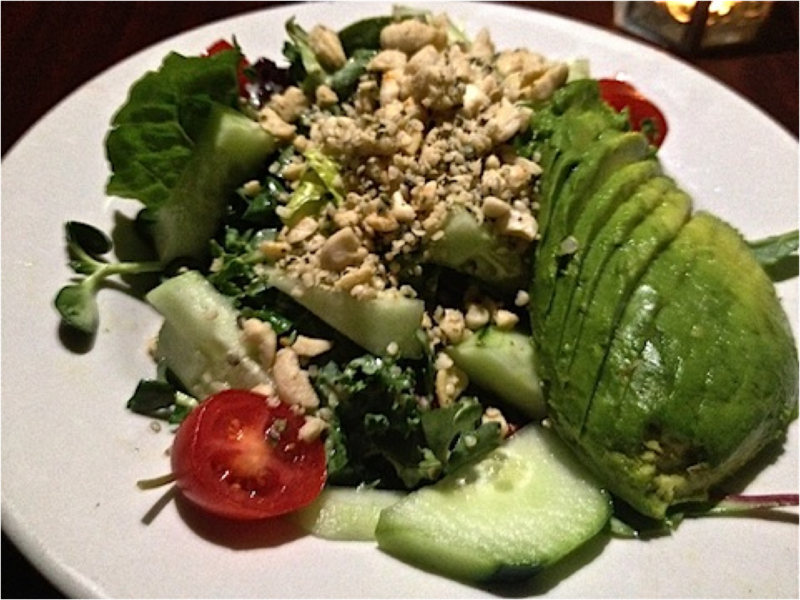 They have really interesting salads, like this omega: kale, sunflower sprouts & mixed field greens, avocado, spiced macadamias & hemp seeds and citrus hemp dressing. Café Blossom (466 Columbus Avenue) has a few locations around the city; I’ve been to their Upper West Side location a couple times now and it has yet to disappoint. 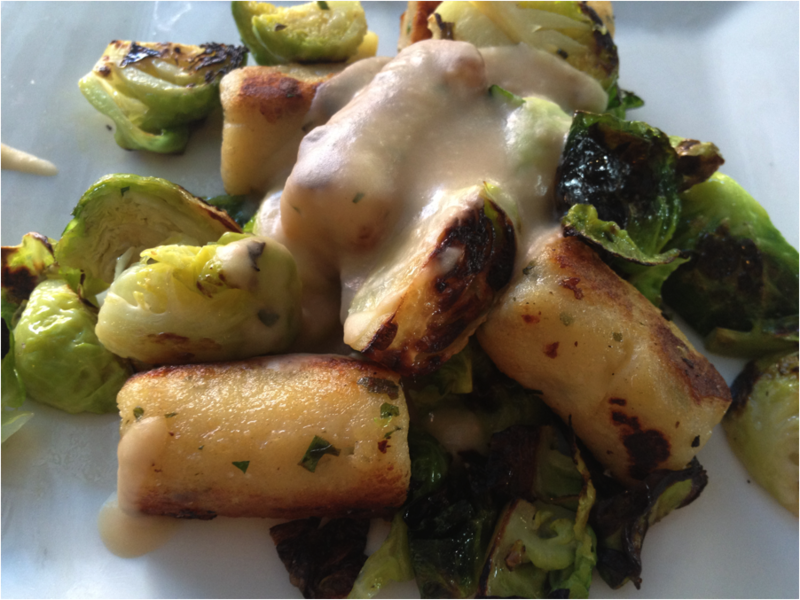 Both times I’ve ordered garlic herb gnocchi with sautéed Brussels sprouts, white bean puree, and fresh lemon. And both times, my boyfriend and I have also split a slice of their giant chocolate cake, which will rock your socks off. Candle Café (2427 Broadway) has become one of my mom and my go-to spots when we want a nice night out, just the two of us. 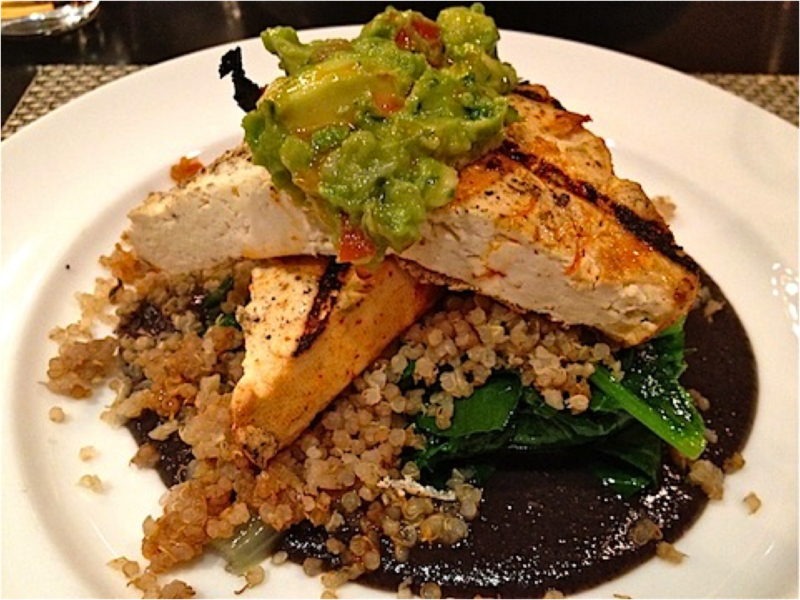 I’ve never ordered a dish there I didn’t like; their chili grilled tofu with quinoa-vegetable pilaf and sautéed kale over a black bean sauce comes served with avocado salad and has such an interesting mix of flavors and textures. They also have a notable organic wine and beer list, if you’re so inclined. 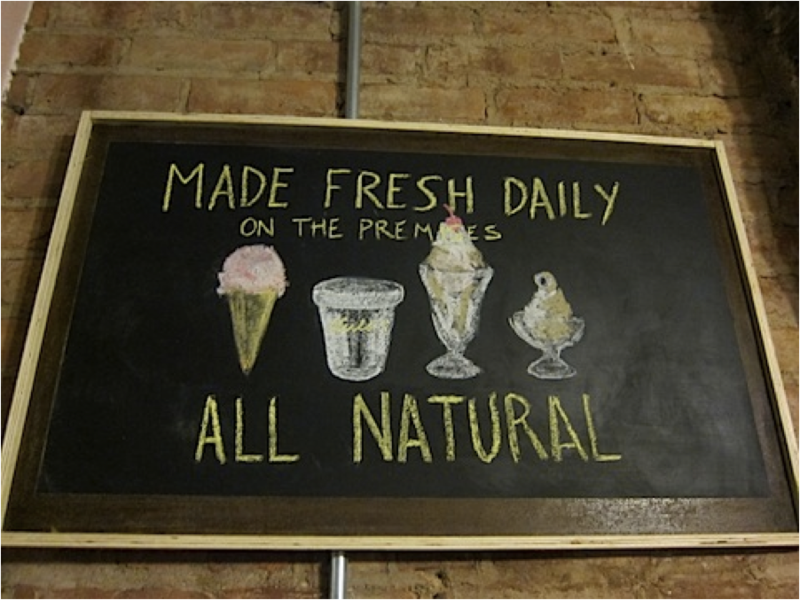 After your meal, stroll a block East for a scoop at Lula’s Sweet Apothecary (516 East 6th Street), an all-vegan ice cream shop that will make you nostalgic for bowties and barbershop quartets. Yum! Gotta plan my next trip! My vacation was coming to a close, and my wallet was hurting just a bit. 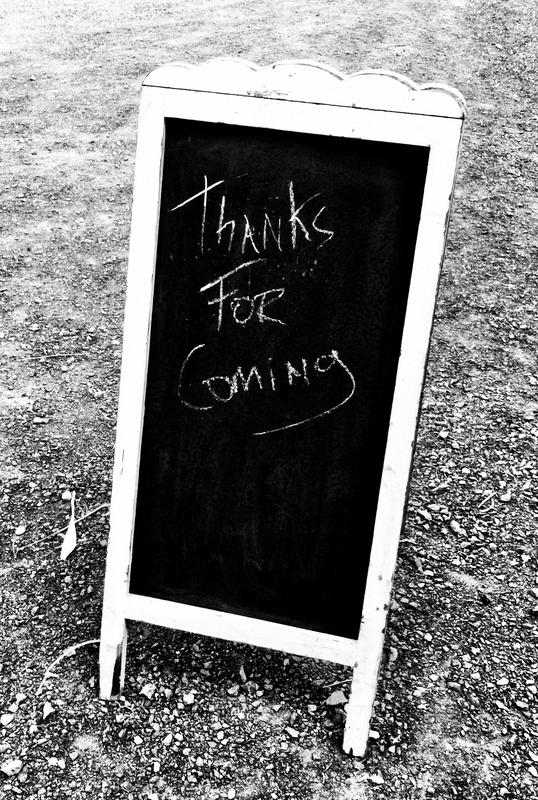 Luckily, we had planned a trip to the farm for my last full day in New York. As much as I love dining out, there is an extraordinary amount of value and appeal to picking out ingredients and building a meal from scratch in your own home. Even better? 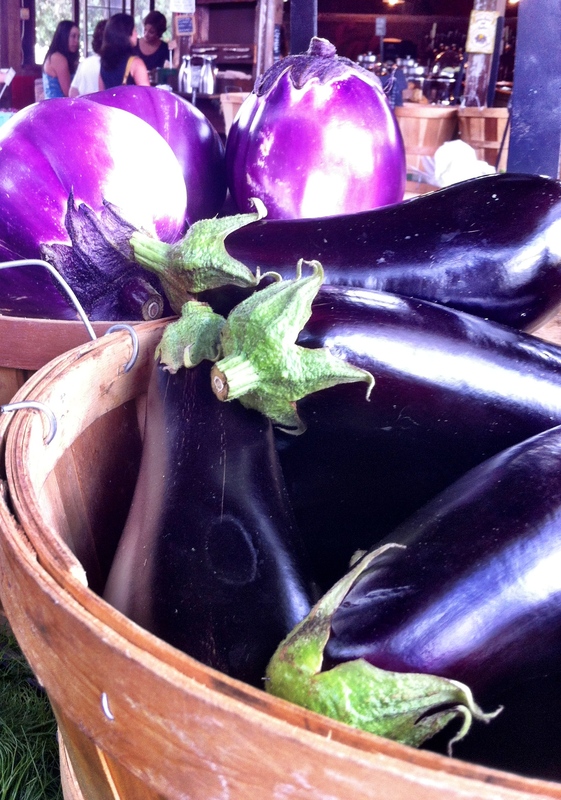 Traveling directly to the source of your food, talking with those that have grown or raised it, and selecting the best specimens from an array of fresh, local foods. Others write much more eloquently than I on the value of slow, local, organic, biodynamic, etc etc. I don’t feel qualified to comment on such a socially-complex and politically-charged arena, but I do know that I, as a consumer, am thoroughly enamored of the idea and, ultimately, my luxury in choosing locally-sourced food literally at the farm where it was grown. 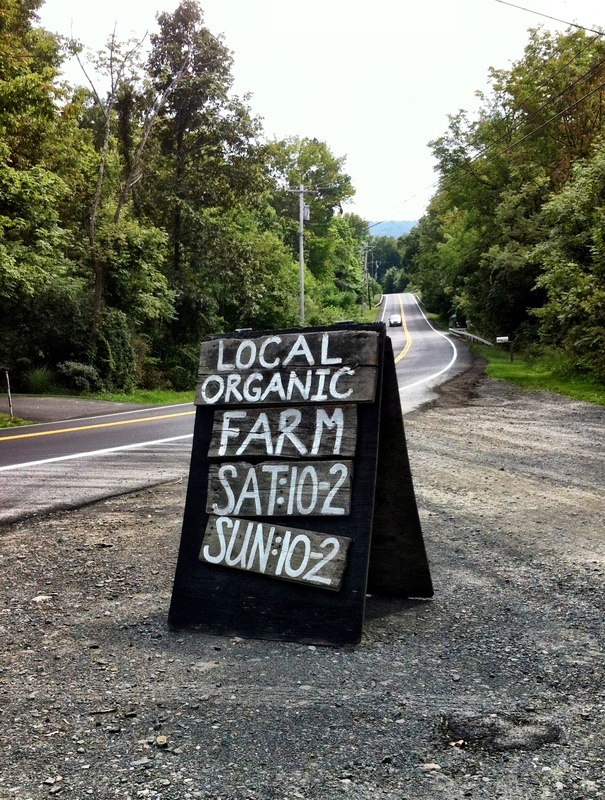 Dane, Nolan and I had a laughably easy, and beautiful, commute out of the city to Blooming Hill Farm—only about an hour away. 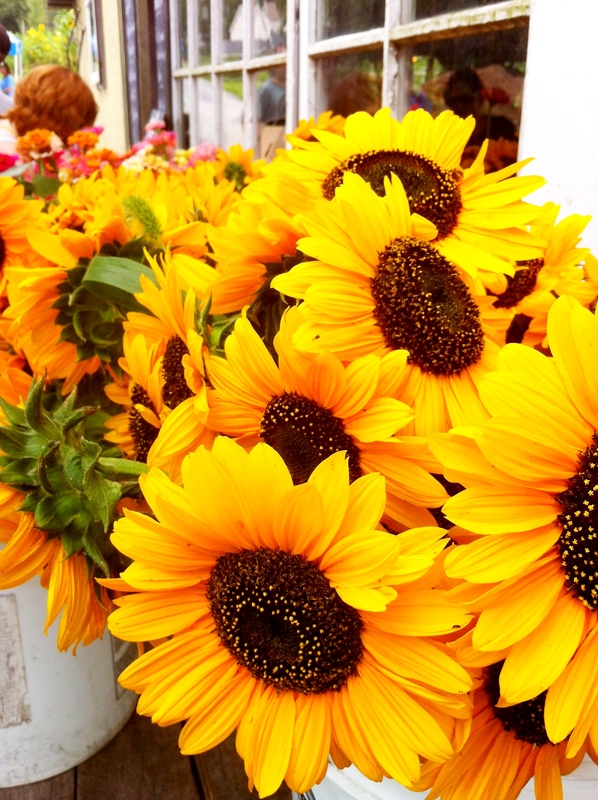 Blooming Hill is not just a fantastic farm; it represents a truly inspired business model. 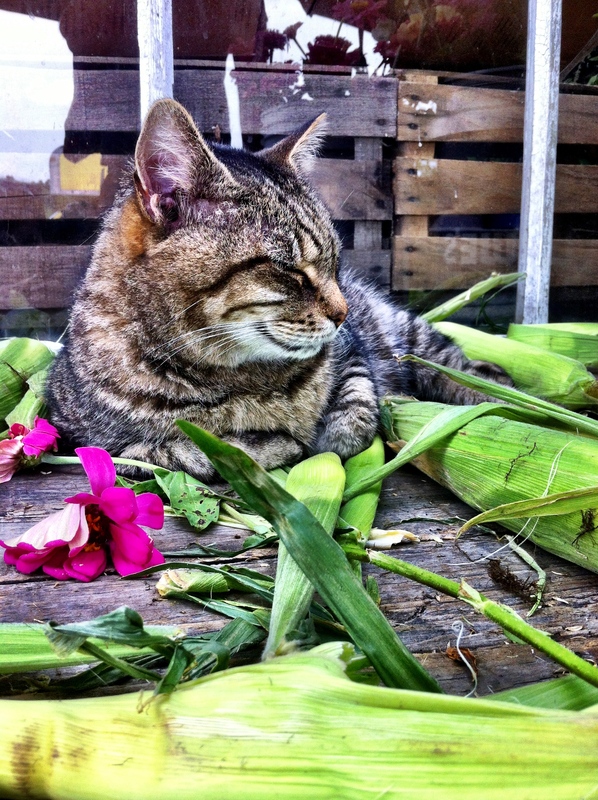 The on-site shop caters to hip New Yorkers—it’s just rustic enough to seem authentic (the feral cats sleeping in the pile of corn were legitimate), but it has been meticulously designed with subtle touches of “barn-chic.” Vintage milk bottles are lined up behind the prepared foods counter, and reclaimed barn doors provide structure and a bucolic aesthetic. It was well done–visually stunning. Lining the tables are fresh, ripe and almost ridiculously gorgeous examples of the farm’s produce. 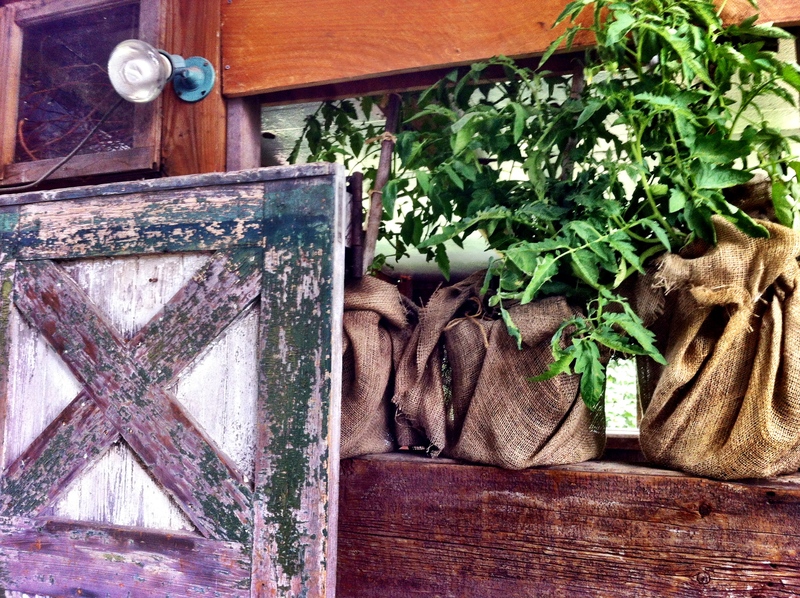 An entire table is devoted to fresh herbs—a lush forest that borders crates of deep purple plums and yellow peaches. 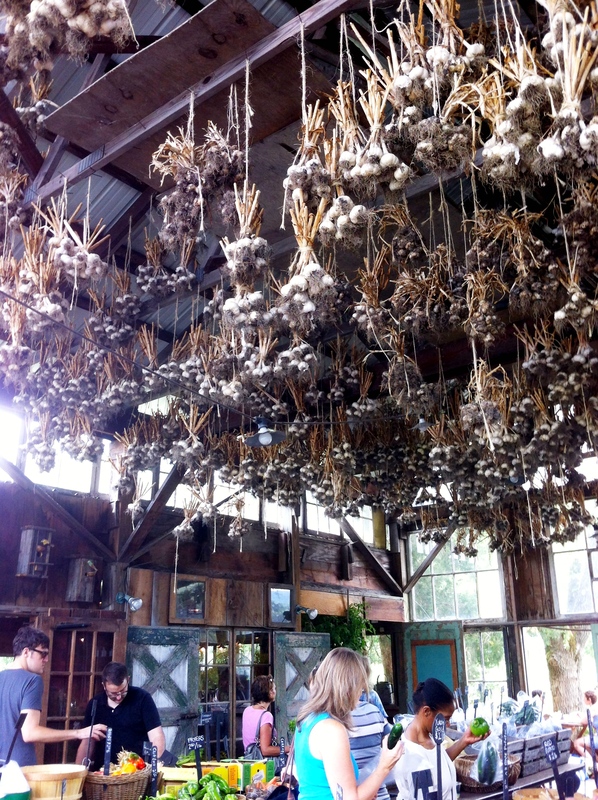 Bunches of garlic hang from the ceiling, and the gigantic faces of sunflowers cheerfully smile at you while you pick out the perfect kale and heirloom tomatoes. The trip would not have been complete without an order at the small in-house restaurant; we ordered both the red and white pizza—tomato, mozzarella and basil, and homemade ricotta, fennel and roasted garlic, respectively. 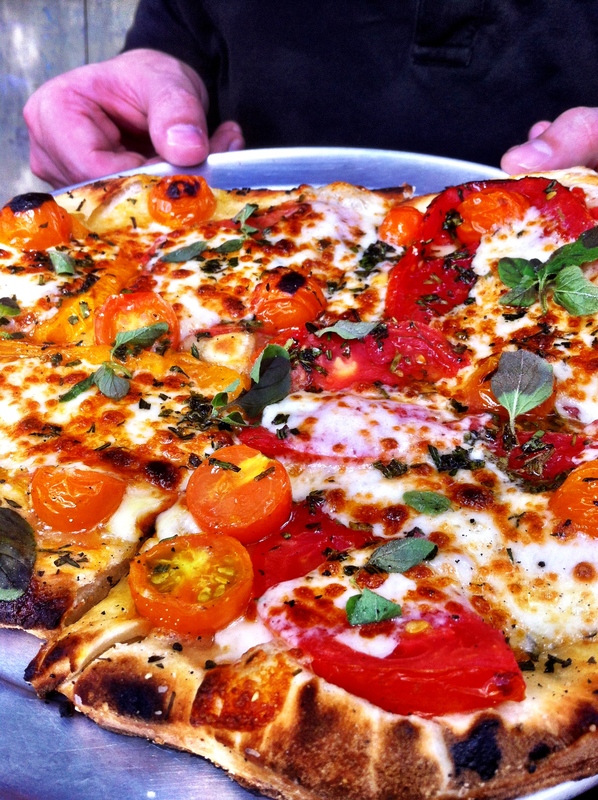 One may not expect delicious pizza from a farm, but the freshness of the ingredients made for some damn good eating. It was not until we returned to the car with our bounty that we started discussing what kind of dishes we would prepare. 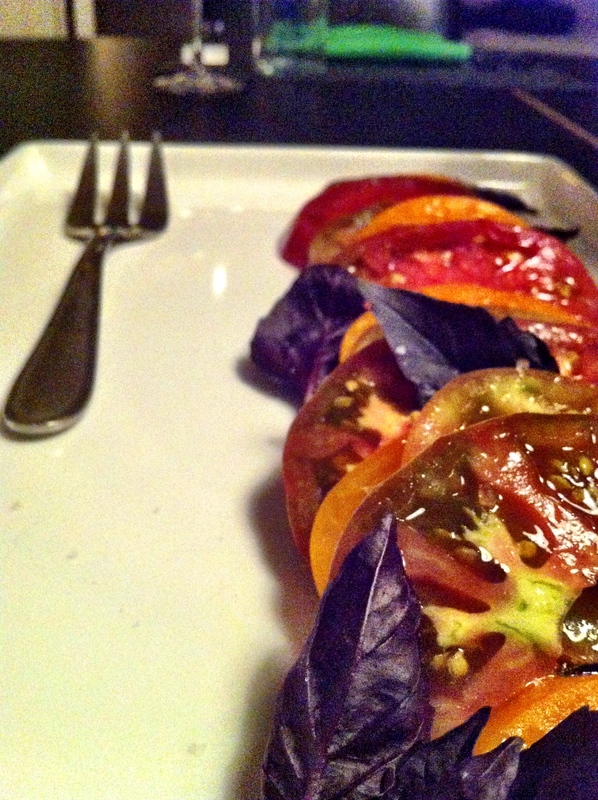 We had picked out beautiful food, and we wanted to let the ingredients determine our meal. It was decided that we would visit a new butchery on the upper West Side for a perfect slab of ribeye to complement the produce that we had collected. 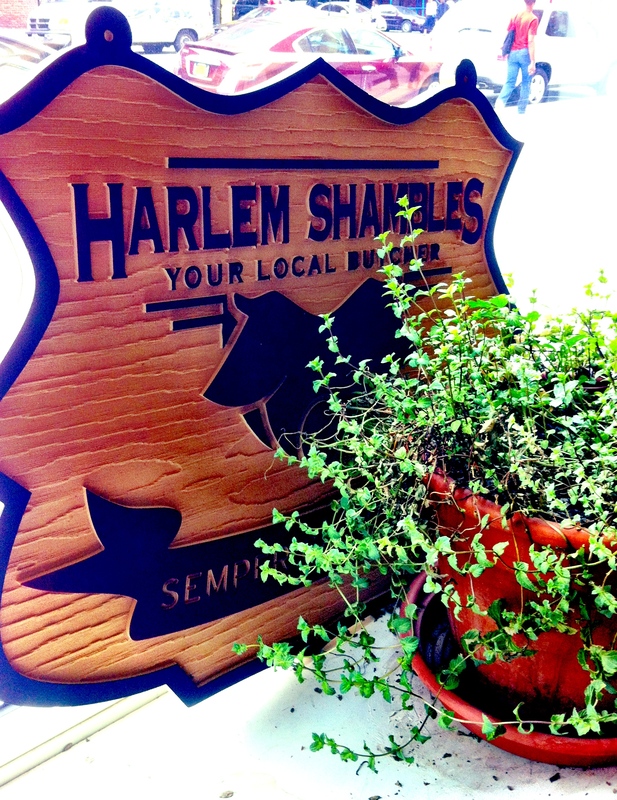 We were not disappointed with Harlem Shambles Butchery, and the bowtie-clad butchers (the art of butchery seems to have gone a bit rogue) chose for us the most perfect cut of meat. After procuring a few bottles of wine and gin to accompany the meal, we returned to Dane’s apartment. With the ribeye (quickly seared on both sides, just enough to leave a deep pink center) as our main, we decided to roast sweet purple, orange and white carrots with herbs in a cast-iron pan, throw together a reduced kale salad with pecorino, and slice the fat, colorful heirlooms tomatoes to serve with purple basil and a bit of sea salt. 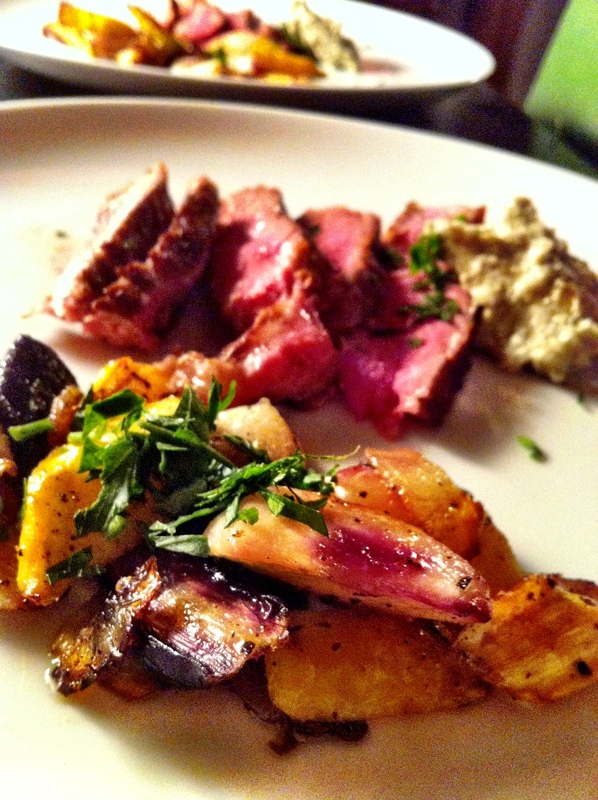 After Nolan and I were caught munching on a particular blue cheese we found in the fridge, Dane quickly commandeered it to create a blue cheese butter to accompany the ribeye. A few gin and tonics, and a couple glasses of wine later, we had laid out the meal. I can only say that though each dish was deceptively simple, the outrageously flavorful ingredients made each dish really luxurious and wildly appetizing. Dane, as always, did most of the cooking, but I made a minor contribution in the form of dessert. 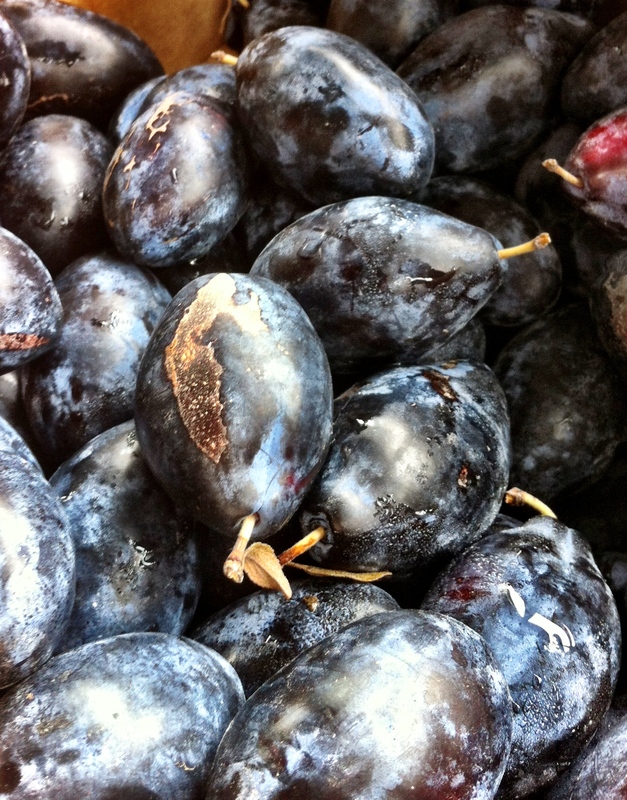 We had chosen some midnight blue plums at the farm, and a quick combination of lemon juice, raw sugar and cinnamon with the sliced plums delivered a perfectly tart and sweet plum compote to top vanilla ice cream. One should never skip dessert. The morning after, I made the trek back to DC. Spying the pathetically empty fridge, I promptly went out to purchase a microwave pot-pie for dinner. It’s really all about balance—one day you’re eating a locally sourced meal, meticulously prepared by your faux-chef brother, and the next, you may just be popping a microwave dinner in. Vacation ends, and the real world sets right back in again.